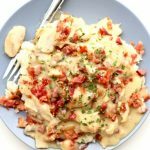 Tender bites of chicken, mushrooms and bacon with a creamy honey mustard sauce made quickly in your electric pressure cooker. Add chicken broth, honey, mustard, garlic and olive oil to the Instant Pot. Whisk well. Add in the mushrooms and the chicken. Salt and pepper the chicken lightly. Cover and secure the lid. Make sure valve is set to “sealing.” Set the timer to 15 minutes. After the timer is up let the pressure release naturally for 10 minutes then move the valve to “venting.” Remove the lid. Stir in the bacon and the milk. Turn the Instant Pot to the saute function. In a small bowl stir together 3 Tbsp of cornstarch and 3 Tbsp of cold water until smooth. Stir the mixture into the Instant Pot. This will thicken up the sauce almost instantly. Serve chicken and sauce over rice, quinoa, noodles or mashed potatoes. I served this chicken and sauce with Instant Pot Mashed Potatoes. There are a lot of different chicken options you can use for this recipe. I used frozen boneless, skinless chicken thighs for this recipe. But you can also use thawed chicken. The pot will just take longer to come to pressure with the frozen chicken. If you don’t like chicken thighs you can also use chicken breasts. Just cook the breasts for 12 minutes instead of 15 minutes. I think bone-in chicken would work wonderful with this sauce. I would just remove the skin before adding it to the Instant Pot. Bone-in chicken takes longer to cook as well so I’d increase the cooking time to 18-20 minutes.